Dystopian August gives a warm welcome to Author Claire Merle. Her debut THE GLIMPSE comes out with Faber & Faber in the UK on June 7, 2012 and I’m totally intrigued. 17-year-old Ana Barber lives in a society where the Pures are divided from the crazies on the basis of genetic testing for mental illness. Her geneticist father faked her DNA tests to get her into the community, a safe haven from all the crazies who live on the other side of the wall in the city. Ana is really a sleeper which means one day she’ll go psycho, or schizo, or suicidal like her mum. When the authorities discover the truth, the only thing standing between her and banishment to the city on her eighteenth birthday, is her romance with Jasper Taurell, a rich boy from an influential community family who wants to Join with her despite her genetic defects. If she Joins with Jasper before she turns eighteen, she’ll be allowed to stay in the community until her illness activates. But four weeks before their big day, Jasper disappears. To be honest I’ve never thought of my own story ‘The Glimpse’ as dark, although it is set in a world where ninety percent of the population are mentally ill and a vast part of London is like a giant, chaotic loony bin. So yeah, I guess it is! One of the things that draws me to ‘dark’ stories is the way they magnify, exaggerate and throw up questions about problems in our own society, (Uglies, Feed, Hunger Games). A world where those running society are clearly evil or corrupt provides a tangible framework for heroes and heroines to fight back; to fight for everything we most value as human beings—humanity, justice, truth. (I do like plenty of action!) By emphasizing the worst aspects of human nature, such as greed, cruelty and the corruption of power, a ‘dark’ story allows the light to shine brightly on deeds of courage, selflessness and justice. As a reader, I find viscerally experiencing the struggles of a character to overcome their fears or limitations and defeat ‘powers of evil’, exciting and uplifting. As the saying goes, ‘in the darkest corners the light shines brightest of all.’ I read dark stories to be uplifted! If THE GLIMPSE had a theme song, what would it be and why? Well, Ana my heroine plays classical piano, and while I was writing The Glimpse, I imagined a mix of classical music with pop rock to capture the two divisions of society—the Pures and the crazies. In my head I had a mix going of Black Eyed Peas ‘Meet Me Halfway’, with Rachmaninoff’s Piano Concerto No 2 in C minor. Course, I’m no DJ! Haven’t got a clue I’ve if it could really be done and work! What fictional character from another book would Ana chose as her best friend and why? I’m going to cross time and genre here and go with Elizabeth Bennett from ‘Pride and Prejudice’. She would admire Elizabeth’s wit and intelligence and her ability to show so much self-control in the confines of a small-minded society, while maintaining her integrity. The Pure society where Ana has been raised by ‘accident’, (she’s not Pure), shares this aspect of small-mindedness and has similar pressures on Pure girls to make good matches. When it comes to light that Ana belongs on the other side of the wall with the crazies, (her geneticist father is suspected of changing her Pure test but nothing is proved against him,) Ana has to bite her tongue and suffer the prejudice and judgments of those around her, because being shoved out with the crazies would be even worse. Of course, she can’t restrain herself forever! Once the boy she’s supposed to Join with goes missing, she sneaks into the city to find him and enters a dark, mysterious world that brings her to life. Hunger Games—the best of the best. Never Let me Go—beautiful, subtle and haunting. Divergent—great action, romance and intrigue. OK, you need to know a) I’m an optomist and b) I’m a planner. So if the world’s going to end, then I’m going to stop it! And if I can’t stop it I’ll pack up my family and friends and take a boat to the one place where it won’t be flooded, poisoned by nuclear fallout, or burnt to a crisp, and be one of the 10,000 survivors. Of course, on a personal note I’d be totally gutted if the world ended next year, because my book’s not out until June 2012! What makes your book stand out from other books in the genre? I think there are lots of wonderful dystopias out there that are both exciting and thought-provoking. 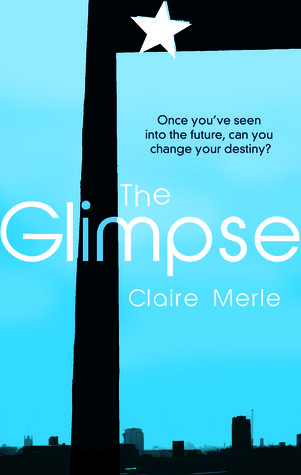 While ‘The Glimpse’ shares similar elements of thrilling action, great romance and strong, enticing characters, what makes it stand out is the frightening and all-too-possible future. Science and the global approach to mental health are currently hurtling towards a terrifyingly similar situation. ‘The Glimpse’ isn’t so much a ‘what if we do?’ scenario—what if there was an operation to make everyone supermodel beautiful; what if love was a disease; what if a genetic virus made everyone die young—(all fantastic books by the way!) 'The Glimpse' is a rather scary ‘what if we don’t?’ scenario. What if we don’t change the direction we’re on—is this where we’ll end up? Thanks for letting me hang out on your awesome, dystopia-obsessed blog. Love it! I love--and fear!--the "what if we don't?" model of dystopia. Just put The Glimpse on my to-read list; it looks fascinating--and terrifying! The Glimpse sounds totally fascinating to me, for so may different reasons, and I am now anxiously awaiting the chance to pick this one up for myself. I also like the novels that she chose as favorites, and have seen Divergent come up so many times that I can't ignore it anymore. Time to go shopping, I think! Thank you Diva and Zibilee for your interest in The Glimpse. And yes, Zibilee, Divergent's one you don't want to miss! And thanks again Lenore for the cool/ difficult questions. This sounds really good, yet another to add to the wishlist! Claire - You are so funny! I love how you answered the question what would you do if you knew the world was ending. "I'd stop it and save the world." Hahaha. Your book sounds great. I can't wait to read it. Do you know when it will be released in the US? Miss Lauren--Hopefully it'll be out in the US at the same time as the UK (June 2012) but the date isn't fixed yet. If you want updates, hook up with me on twitter (I'll follow back) or my author facebook page. Thanks for your comment!